The tomb of Abbas Gharabaghi in Père Lachaise Cemetery. Arteshbod Abbas Gharabaghi (Persian: عباس قره‌باغی‎; 1 November 1918 – 14 October 2000) was the last chief of staff of the Iranian armed forces as well as deputy commander-in-chief of the Iranian Imperial Army during the rule of Mohammad Reza Pahlavi, the last Shah of Iran. Gharabaghi served as the gendarmerie commander until 1979. He was appointed chief of staff of the Iranian armed forces on 7 January 1979. His role was to support the Shah until the Shah left Iran, and then to support the civilian government the Shah left behind led by Prime Minister Bakhtiar. However, after much strife on the streets of Tehran and elsewhere, on 11 February 1979 Gharabaghi, along with 22 other senior military leaders, withdrew support of Bakhtiar, thus tacitly supporting the revolutionary Islamic republic. Gharabaghi published his account of the revolution in his books Haghayegh Darbareye Bohran-e Iran ("Facts About the Iran Crisis", 1983), and Che Shod Ke Chonan Shod? ("Why did it happen? ", 1999). It is said that his decision to declare the army's "neutrality" was the main reason for the final triumph of the Iranian Islamic Revolution which ended the monarchy. In his first book, Gharabaghi expresses his strong support and loyalty to the Shah and paints a detailed picture of the chaos within the military ranks caused by the last government under the Shah which clearly holds Prime Minister Bakhtiar responsible for the downfall of the monarchy. He justifies his decision to declare the army's "neutrality" as the only reasonable solution given the circumstances and in order to prevent further bloodshed and calls Bakhtiar a traitor. 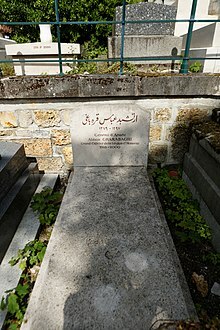 Gharabaghi died in Paris in 2000. ^ Roberts, Mark J. (January 1996). "Khomenei's incorporation of the Iranian military" (McNair Paper 48). National Defense University. Retrieved 31 July 2013. ^ Gharabaghi, Abbas (1983). Haghayegh Dar Bareye Bohran-e Iran. Sāzmān-i Chāp va Intishārāt-i Suhayl. This page is based on the Wikipedia article Abbas Gharabaghi; it is used under the Creative Commons Attribution-ShareAlike 3.0 Unported License (CC-BY-SA). You may redistribute it, verbatim or modified, providing that you comply with the terms of the CC-BY-SA.